Hello! It's time for a brand new Mojo Monday sketch (#234). It's Round or Square week, and Julee has created a couple of great sketch options for us to play with! 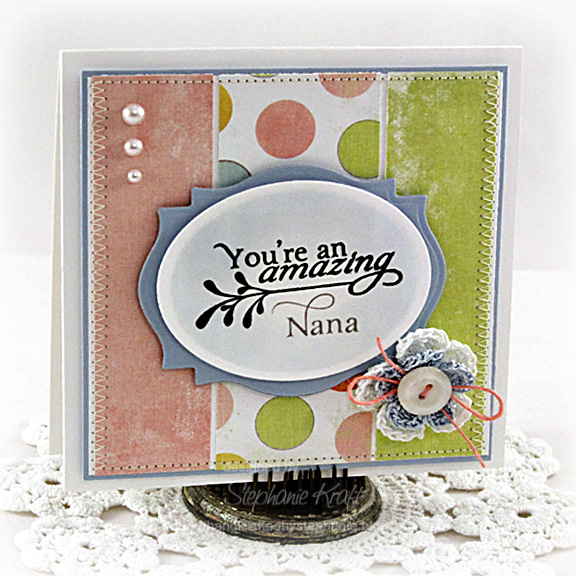 Accessories: Labels Eighteen and Classic Oval (LG) Nestabilities (Spellbinders); Crochet flowers (Sister Mary), Pearls (Prima), Button, Twine (May Arts), Foam tape, Thread, Sewing machine. Beautiful, Stephanie! Love the color combo! adorable, luv the polka dots..sooo sweet...hope you have a great week! Such a sweet card Stephanie! Love the beautifully matted sentiment and sweet crocheted bloom! Thanks for the inspiration! What a cute card! The polka dot paper is fun and the crochet flower is cute. I like how you tied the bow on the back side of the button. I would never have thought of that. Thanks for sharing and have a great week. So pretty. I love the colors and embellishments.